Is Medicare facing a cost blowout from 'urgent' after-hours care rebates? Recent news reports have signalled another potential Medicare cost blowout; this time due to the billing practices of GPs providing care after hours – at night, on weekends and on public holidays. The reports cite Department of Health data that shows A$195 million was billed to the Medicare Benefits Schedule for urgent after-hours visits (under item number 597) in 2015, compared to A$90.8 million in 2010. Inappropriate use of this item number by private medical deputising services (MDS) – companies that employ registered medical practitioners to provide after-hours care – is thought to be behind the alleged blowout. There are also concerns quality of care after hours may be lower when the GPs working for deputising services may have less experience than those employed by regular GP practices. A recent government review of GP after-hours services found no solid evidence of whether care provided by deputising services was more costly or of lower quality than that of regular GP practices. However, when looking at the numbers, it is clear the cost of after-hours services has grown much faster – by 98% in ten years – than the overall cost of all Medicare GP services, which grew by only 60% over the same period. As the below graph shows, since 2012 there has been an upturn in the growth of the cost of after-hours care. These figures have been adjusted for population growth. 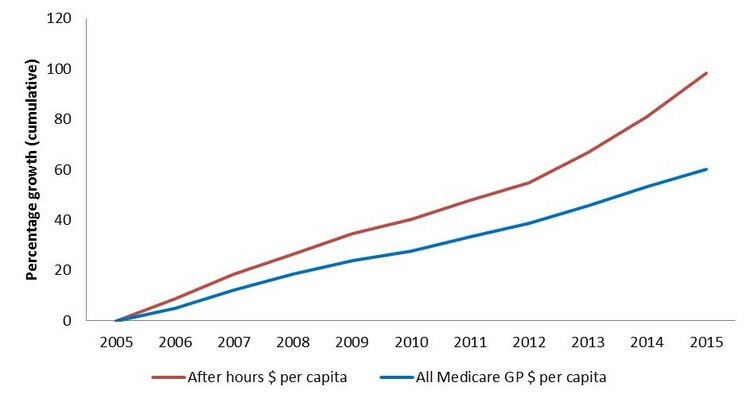 How much of this growth is due to MDS services is more difficult to show as Medicare data doesn’t distinguish between MDS services and those provided by regular GPs. But regular practices are increasingly using deputising instead of providing care after hours themselves. Data from the BEACH study show the proportion of GPs working in practices that only used deputising services after hours increased from 38.3% in 2005 to 48.2% in 2014. Deputising services are private companies, regulated by Commonwealth legislation, that can only provide services in the government-defined after hours periods. These private companies have a strong incentive to convert a phone call to a visit, as only the latter attracts a fee. They are not allowed to schedule follow-up visits or further appointments beyond the current after-hours period. Only the patient or “other responsible adult” can initiate a visit. Deputising services are therefore driven by demand, from patients requesting services and practice-based GPs. The number of government-approved deputising providers has grown from 16 in 2006 to 83 in 2014. It is possible to break down the Medicare data as there are separate items for non-urgent after-hours visits to residential aged-care facilities (A$70 per visit), non-urgent GP clinic visits (A$53 per visit), non-urgent home visits (A$74 per visit), and urgent visits in clinics, residential aged care or at home (A$132 per visit). The below graph shows the changes in the mix of funding for these visits over the past ten years. Though all types of visits can be provided by GPs in deputising services or regular practices, it is clear the proportion of after-hours spending for urgent visits and visits to residential aged-care facilities were falling until about 2011, and then rose. After controlling for the increasing population, spending on non-urgent, after-hours visits to aged-care facilities increased by 90% since 2011. 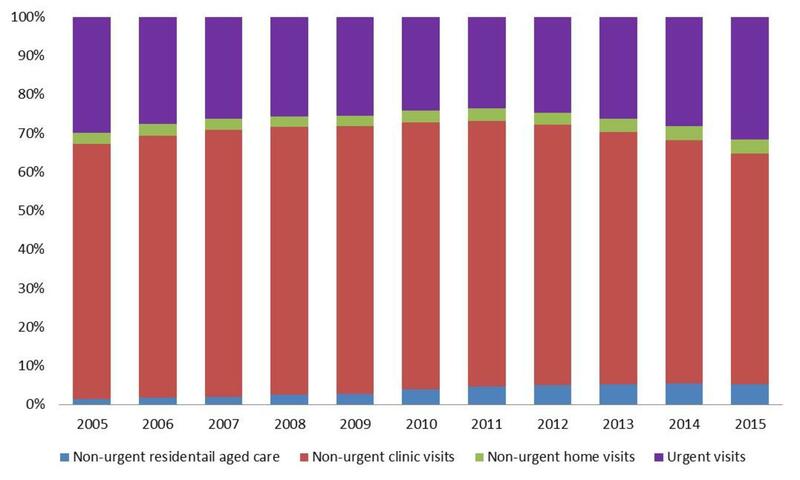 In the same period, spending on urgent visits (including aged-care, home and clinic) increased by 32%; there was a 30% increase for non-urgent home visits, and non-urgent clinic visits increased by 14%. There is no definition of “urgent” provided in the Medicare Benefits Schedule – it is entirely up to the GP or deputising service to determine. This seems to be a flaw in the payment system as it is doubtful whether an urgent visit requires double the resources as a non-urgent visit. More evidence is required to appropriately set the fees and definitions of urgent visits. The Royal Australian College of General Practitioners (RACGP) recently called for after-hours services to be formally linked to regular clinics, in part due to concerns that junior doctors employed by MDS were providing lower quality care to patients. Yet regular GPs do not want to provide after-hours care. And our research shows that practice-based GPs cannot be persuaded to provide more after hours care by financial incentives. In fact the RACGP’s own standards were changed in 2013 where the duty of GPs to provide care 24/7 was removed as the then new Medicare Locals took over some of the funding for after hours care. So deputising services, that are accredited according to RACGP standards, are filling an unmet need. It is also possible they are seeing patients who would otherwise be presenting to emergency departments, saving the health system money. However, since the GP from an MDS is not the patient’s regular GP, and it is not yet possible to have a portable electronic medical record that could be accessed by the deputising service, the patient could receive lower quality care simply because the MDS GP doesn’t know the patient’s medical history. This also means patients could secure prescriptions their regular GP may not provide. MDS services are claimed to often hire younger doctors with less experience or those from overseas with different training and cultural backgrounds. These GPs are considered to be undergoing training, though how they are being trained is unclear. MDSs are recognised as having a critical role in meeting after hours needs, providing valuable support for GPs already working long hours, access to home visits and in many cases good continuity of care. However, the review also recommended deputising services not be able to advertise directly to the public and that they should move away from a fee-for-service funding model. These recommendations have not been acted upon, but reports that the Medicare Benefits Review Taskforce will examine these issues are welcome.